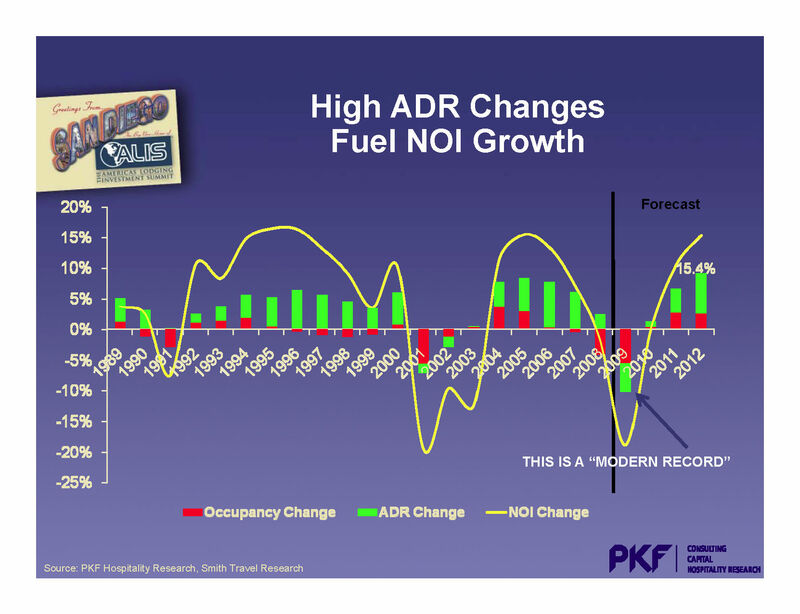 Hotel Lawyers with the pulse of the hotel industry from ALIS. Mark Woodworth of PKF Consulting shared his latest analysis of the hotel industry with us, as well as his slides from the ALIS conference. 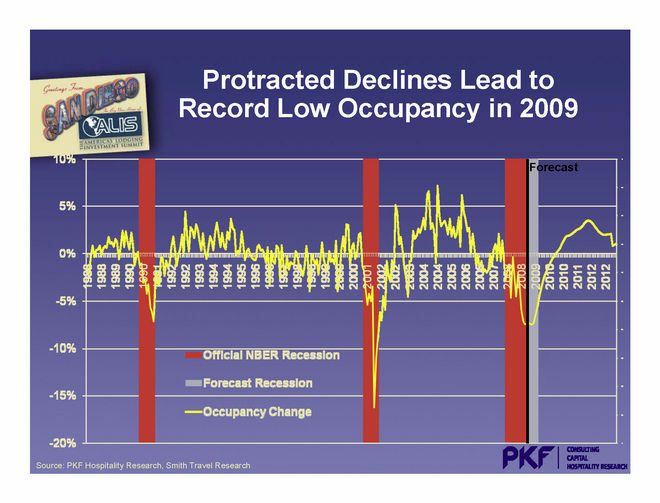 The picture is not pretty. 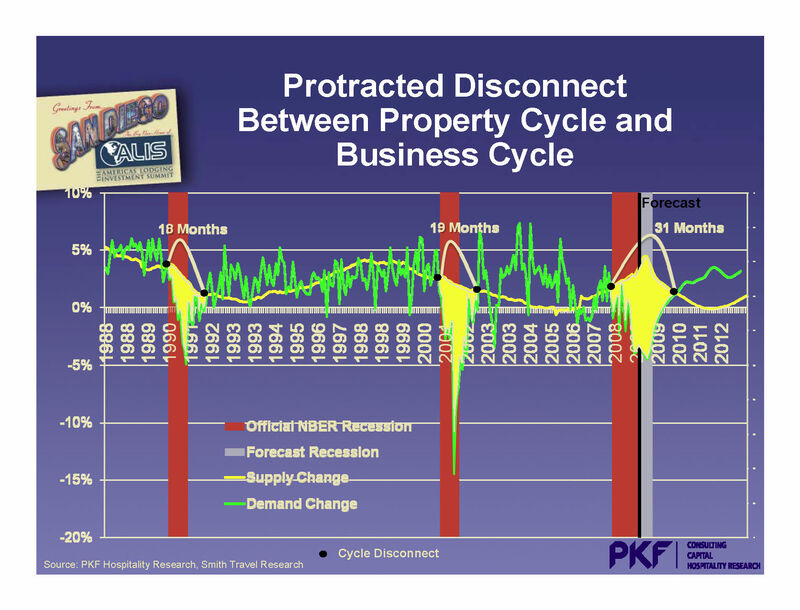 Mark says, that if you’re waiting for the recovery, the key word is “PROTRACTED.” Here are the details. 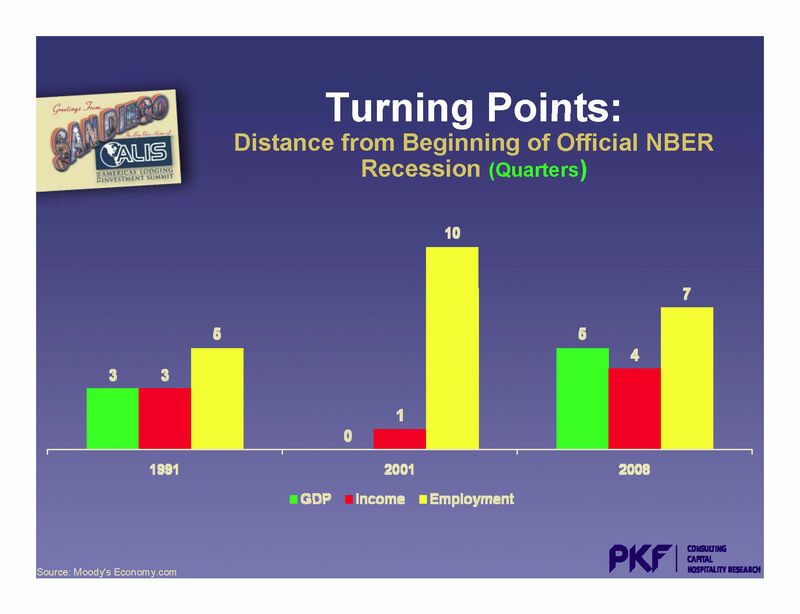 Mark Woodworth views employment as one of the best measures of the economy’s health. Conversely, unemployment shows the economy’s weakness. 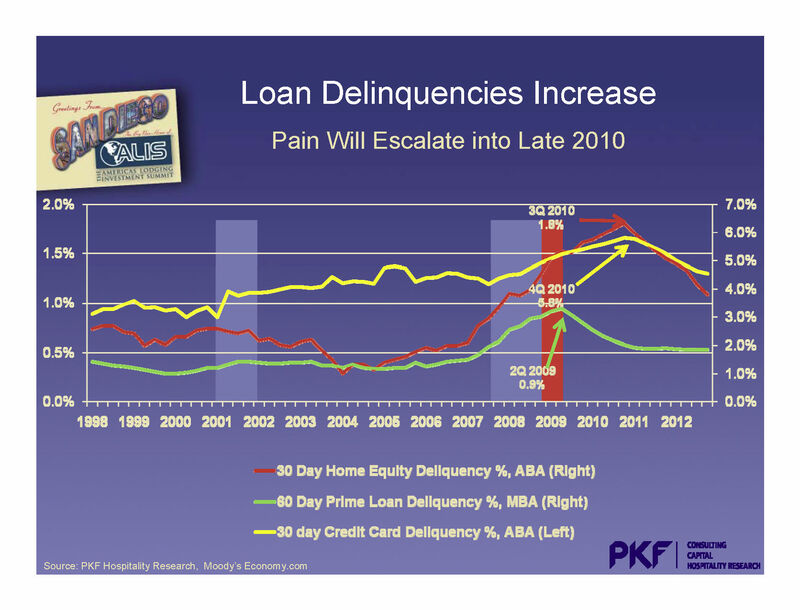 The situation is pretty bad and has been getting worse. The following slide shows actual and projected unemployment and how the forecasts have worsened from August to October and now January 2009. 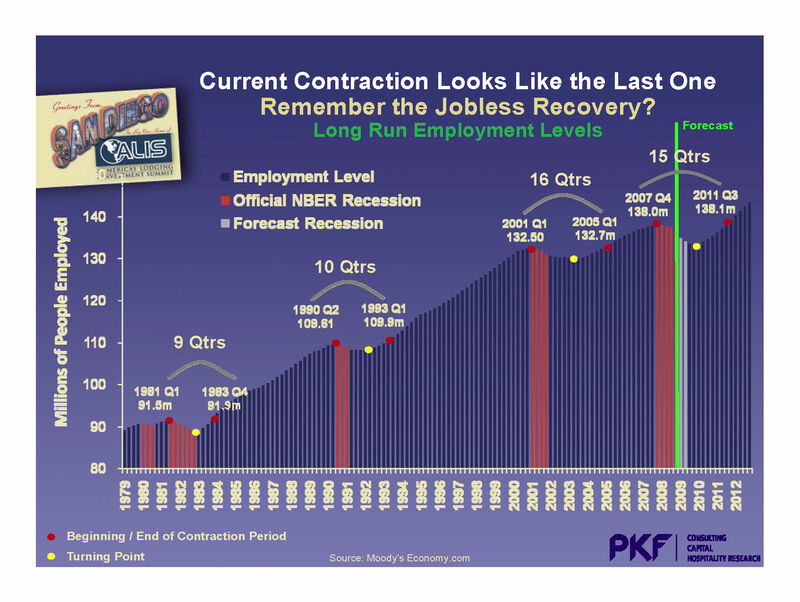 The experts from PKF consulting are projecting that it will take 15 quarters for employment to return to its prior levels. If true, this would be one of the worst unemployment periods since 1979, as shown in the following slide. 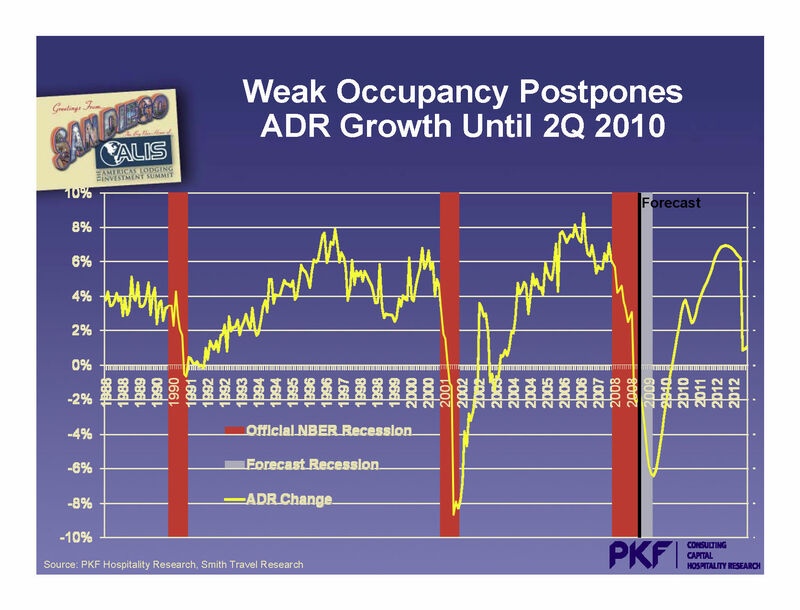 When will the hotel industry recover and what are the turning points? This leads to protracted declines in occupancy and ADR, with ADR recovering only in the second quarter of 2010. 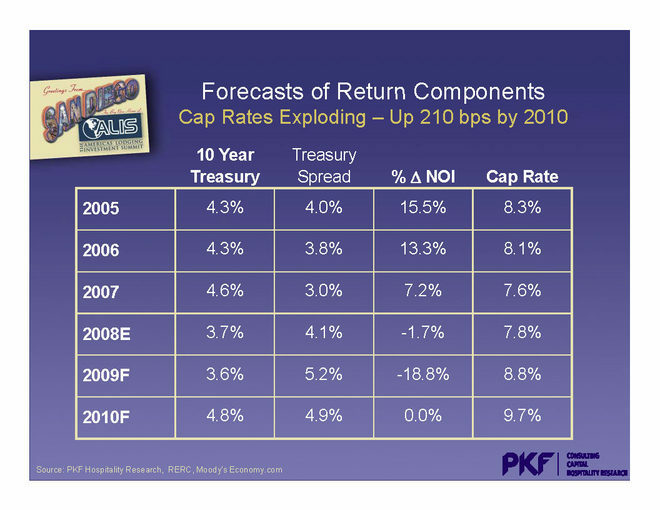 PKF Consulting is forecasting an “explosion” in cap rates for hotels, up by 210 basis points from today through 2010 to 9.7%. 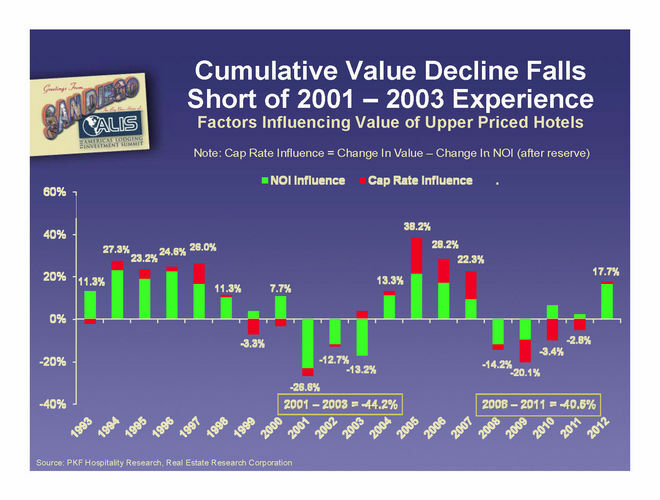 Falling NOI and exploding cap rates lead to a projected decline in hotel values of more than 20% in 2009, with no significant improvement in values until 2012. Although PKF Consulting is projecting a national average decline in RevPAR of 9.8% for 2009, the impact of RevPAR declines on NOI will depend upon the occupancy level of the hotel as it enters 2009. 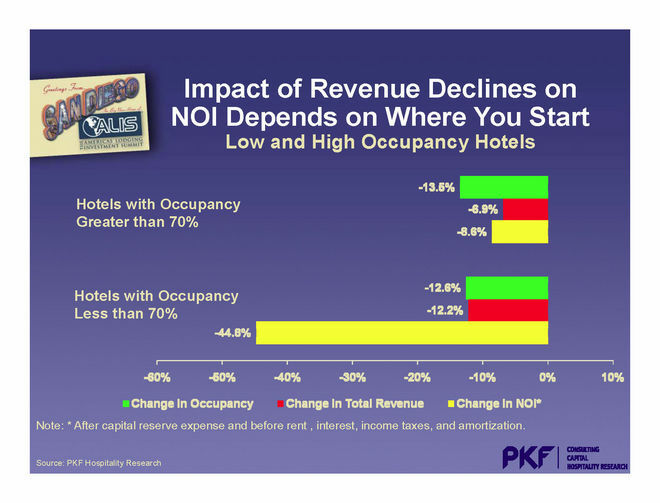 The following chart shows PKF’s projections that high occupancy hotels (with occupancy greater than 70%) will have NOI declines of 8.6%, while hotels with less than 70% occupancy will suffer a 44.8% NOI decline! So where does this leave lenders and borrowers in terms of “loan to value” or “LTV” ratios? 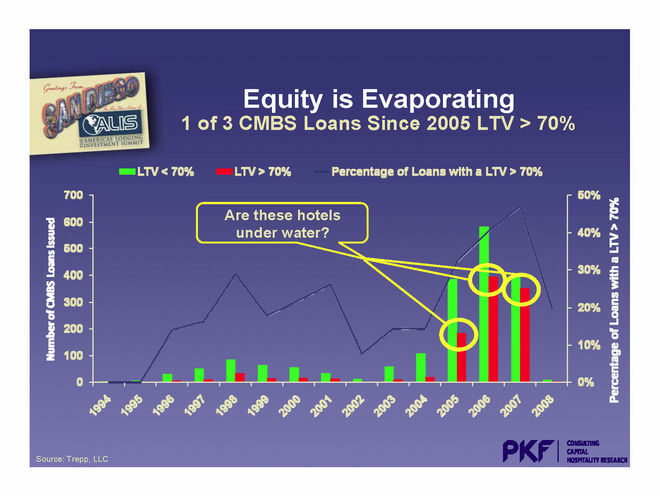 This final slide suggests that at the end of 2008, less than 20% of the CMBS loans originated since 2005 still had an LTV greater than 70%. Let me turn that around to say it differently: At the end of 2008, more than 80% of the hotel CMBS loans have less than a 70% LTV, and in 2009, the experts are predicting record RevPAR and NOI declines with an “explosion” in cap rates of 210 basis points . . . and no improvement in value for some time. 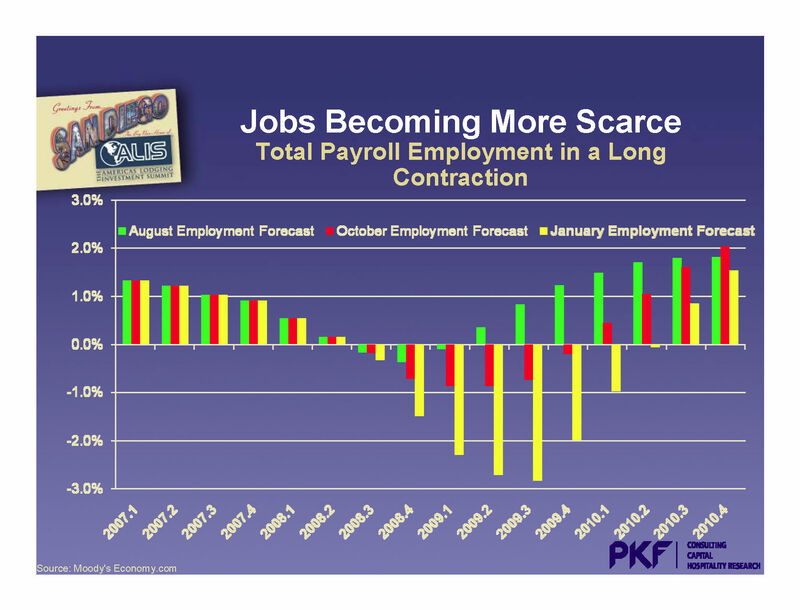 This does not bode well. Hotel bankruptcies around the corner? Hotel bankruptcies have already begun, but we see the flow speeding up as lenders and owners “see the writing on the wall.” There will be tremendous opportunities here for someone. 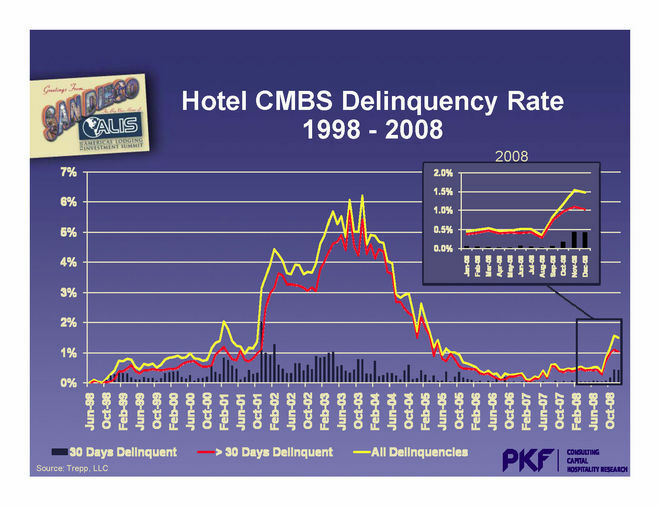 See some of our selected articles at www.HotelLawBlog.com on hotel bankruptcies, workouts and turnarounds.